Sydney, Australia – A Sydney-area company has launched a Kickstarter campaign to fund development of what may be the world’s smartest ski helmet ever… and the most expensive. Forcite’s new $799 brain bucket includes a built-in 4K camera system with a 140-degree field of view to shoot ultra-high definition video, a bluetooth wireless audio system for both music and phone calls, the ability to communicate over WiFi with other Forcite helmet users up to 200 meters away, a GPS to track the user’s location and speed, and motion sensors to log airtime and performance. 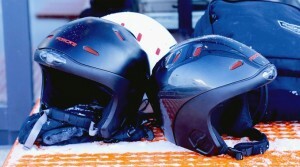 A mobile app that will ship with the helmet allows the owner to share all of his or her video footage and performance stats with friends on social media at the push of a button. Like all ski helmets, the Forcite lid is made from single impact foam, which means that once it’s been involved in a crash you’re supposed to ante up another $800 for a replacement. That’s one costly tumble! The whole shebang weighs 700g (1.54 lb). As of Saturday, 75 backers had already ponied up $61,495 of the project’s $200,000 goal on Kickstarter. Those who pledge $649 or more receive a limited early-edition Forcite helmet with delivery anticipated in January 2016.